"I want to be home,"
"We have to be brave,"
Jack and his big sister Alice are playing in their yard at the edge of the woods when they hear a strange sound. It is soothing, yet eerie and has the power to draw the two into a search for its source. Jack is skeptical, Alice wants to be brave. She takes his small hand and offers soothing reassurances as they walk through the woods. Jack remains unsure, worrying that it might be the Wicked Wolf. He longs for home and his warm, snuggly pajamas. Alice wants them to continue on, until the sound becomes louder and NEARER. Her bravado suddenly vanishes and she wants to head for home. Now it's Jack's turn to show bravery and wonder. He wants Alice to stay. He knows it's a wolf ... but not a scary one! "The Wolf isn't wicked," said Jack. So she is. Listening carefully, they can now hear the song they heard from their yard. It is much clearer now they are closer. It has the desired effect as the wolf cubs drift off, leaving the siblings to find their way home to their own comfy beds for peaceful rest. A lovely story, told with warmth and a touch of mystery, it will be a welcome addition to the bedtime pile at my house. Helen Oxenbury's pencil and watercolor art is done in cool greens and blues. Darkened as they make their way further into the woods, then brightened with filtered light as they find their way home effectively changes mood for her audience. The double page spread where Mama is singing to her babies is wistful. It is a visual treat for all who share it. "Holding a cat funeral was weird enough, but holding a cat funeral when the person who loved the cat was also dead was particularly weird. Yvette was in the ground. Yvette, who had been warm and vital this morning, who had been able to lick herself and purr and stretch in the sun, was now gone forever. Just like Pam was gone forever. It made Hollis's stomach clench, thinking about it." Hollis Darby-Barnes lives in Saint Paul, Minnesota, while Milo Robinson-Clark's home is Brooklyn, New York. They do, however, have something in common. Both are the children of lesbian parents and, it turns out, they share the same sperm donor. Both are angry with their mothers. As teens are wont to be, they feel they have good reason. write ... Post back if you get this. Thanks! They find two others, and join forces with them to find their biological father. It is quite the adventure. Their story is told from alternating perspectives - from Hollis to Milo and back. As the four learn more about each other, they discover clear similarities. Yes, they do find their father. What they do about it, I will leave for you to discover. 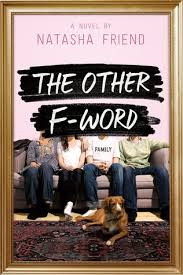 Theirs is a story about family, love, friendship, while also ably infused with humor and emotion. "One day, when Mom is away, a squirrel invades our nest! Luckily, Mom discovers him! Dad pursues him into the woods, pecking at his behind. But only three eggs remain. Mom sits on those three eggs for thirteen days. 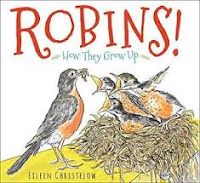 Then the first one she laid begins to crack.."
The 'teenagers' provide us with a plethora of asides about robins, while the author shares careful and considered data concerning nesting, caring for the eggs and chicks, their food, the dangers they face, fledging and even migration. It is amazing how much information is packed into this book's pages, all of it feeling accessible and engaging. With each new fact presented the 'teen' robins add context. As they chat, we watch and learn. From spring to fall, the author presents a concise abundance of data that is endlessly interesting. She lets us know that life is not always safe and secure for the eggs or the little chicks. There are dangers present in a world where predators are always on the lookout for food. I will admit to surprise at some of the information shared. Their first two weeks following the hatch are astonishing. "Over two weeks, we eat about 350 insects and fourteen feet of worms - each! All that food makes us grow quickly, We're almost as big as Mom and Dad! The art is perfect for the text ... full of carefully drawn illustrations presented in a mix of form. Some are three-quarter spreads, some are side by side panels showing movement and change, some show sequences of action; all are accompanied by the teens and their speech balloons in marginal white space, adding accurate and additional info. 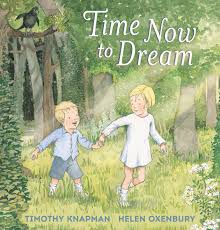 It is a book about birth, chronological growth and development, and magical moments. It is created with a sense of fun, as well as with care and concern for this harbinger of spring. It deserves a place on every bookshelf! An author's note, a glossary, and a question-and-answer provide final appreciated tidbits. If a reader wants to know more - is there more to know? - a list of resources is also there. were full of suitcase. "I -"
Harry's snack for him ... "
It won't be long until the kids are out of school for another year. Wasn't it just spring break? Seems a long past to them, I am sure - especially as the days turn warm and sunny, and the evening's sunshine lasts until after 9. Summer vacation can't come soon enough for many. And the days are not always filled with amazing things to do, or places to go. Some of them can be rainy - and repetitive - and boring! You might want to seek advice from Harry and Clare if that's the case at your house. It's only a week for them. The family is staying home, the rain is falling, and Clare is being the 'boss' for everything they do. Isn't that the way it is for some kids? Despite their circumstance, the two find a way to make the days more adventuresome. On Monday, it's Mars, with Harry carrying all the supplies while Clare takes care of the snacks. Distracted by his hunger and with Clare in charge, he is victim to quicksand. As he sinks, Clare gets to eat his snack. Tuesday is rainy, too. A race car (shopping cart) provides transport at the grocery store. Harry wants to navigate. Clare has other ideas. She lets Harry 'drive and park' their race car (using both hands) while she partakes of their granola bar snacks. Wednesday is not any better. Time for Harry to take control of the adventures and the snacks. He must be very sneaky! When they can get outside on a sunny Thursday, their zoo trip is orchestrated by Clare. Harry keeps mum. His planning pays dividends! Bravo, Harry! 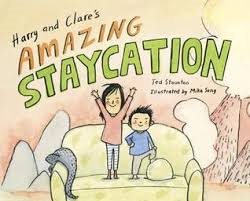 What respect for the imagination and for sibling conflict and resolution is shown in Ted Staunton's storytelling. Fun to read, and an invitation to share adventure and fanciful stories from listeners, the watercolor and ink illustrations show common settings for paired adventure. High-spirited and full of joy, they will have all kids looking forward to a staycation of their own! "She dashes through the woods, crosses a road, leaps onto the top of a stone wall, and looks back. The dogs are still coming. Vixen runs on. She slips through a thicket of thorny brambles. She leaps across a creek and climbs to the top of a steep hill in a cow pasture. There she catches her breath." Foxes have made their presence known in many books for children in the past year. Kids seem to love reading about them, and authors are willing to share their stories. It's a win-win situation for all of us! We meet Vixen on a sunny winter afternoon. Once awakened from a warm and satisfying sleep, she is eager to explore her surroundings. She's hungry. Using her acute ability to smell and hear what humans cannot, she is off to hunt for a juicy meal. As she goes, Laurence Pringle offers up sound information about her anatomy, her diet, and her ability to sense movement even under the deep snow. "She moves her head slowly to better pinpoint the sound. So we travel with her as she hunts, finds her mate, marks her territory, and continues to feast on food found. Danger is ever near. So, she must be vigilant as she searches for a burrow where the two can safely welcome a family in the spring. The kits are taught all the secrets of a fox's life under the gentle guidance of their parents. In early fall, they are ready to venture forth on their own. Mixing storytelling and factual information seamlessly, this book will certainly appeal to many. Adding Kate Garchinsky's pastel and aqua crayon artwork is a perfect match. She captures the beauty of the surroundings, while also bringing emotion and dramatic energy to many special moments for the fox family. I have some favorites, you will have your own. 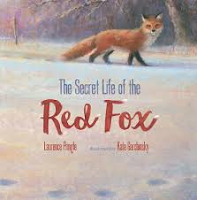 The author includes in back matter a More About the Red Fox section, a glossary for unfamiliar terms used, and a list of resources for those wanting to know more. Stunning! "After she studied, Princess Cora went down to the old castle prison, which the King had turned into a gym. Every day the King stood with his gold watch in his hand while Princess Cora ran in circles and skipped rope up to five hundred. "Faster! Faster! A future queen must be strong!" said the King. "Skipping rope is good for you!" Princess Cora knew that skipping was good ... "
Poor Cora! She enters the world as perfect as can be. It takes no time for her parents to decide she must be 'taught' and 'trained'. Suddenly, they are more concerned with what their daughter's impediments are than her accomplishments. So much is expected of her as heir to the throne. Her parents fill her every day with lessons, and all things meant to improve who she is. Cora is never free to be Cora. Her nanny ensures tidiness, leading to three baths a day. Her mother oversees her reading countless meaningless books. Her father is a stern taskmaster in the gym. Cora does everything she can to please her parents. Some readers who share this book will have great empathy for Cora, knowing only too well how she is feeling. Until one day ... she decides she would love a dog. The idea is firmly pooh-poohed by her parents and nanny. A letter to her fairy godmother is a plea for help. A box at the foot of her bed in the morning does not hold the pet of her dreams; but it might just provide the help she needs. With the arrival of the giant green crocodile Cora begins to see a new and brighter future. The croc promises not to eat anyone so long as Cora supplies him with cream puffs, his favorite food. He manages to take Cora's place, leaving the young princess time for solace and new learning in the woods. Alternating chapters shift venues from the turbulent royal residence to the peaceful pastures and welcoming woods. 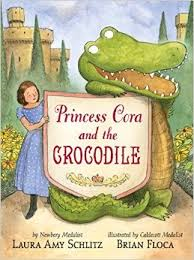 As the crocodile unleashes mayhem in the castle, Cora meanders serenely (albeit occasionally into cow poop) on her own and with no obligations. Is there a happy ending? You will have to decide for yourself. I can tell you that it involves fewer baths, a new pet, and a refreshing sense of independence for the young royal. Laura Amy Schlitz tells a witty, captivating tale. Brian Floca creates ink, watercolor and gouache artwork sure to leave readers in stitches. 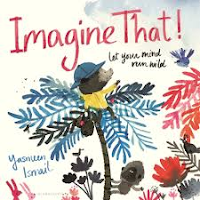 Wonderful to read aloud, and then to pass to a child wanting to read it independently, it is a book that will be loved by many. It's a charmer! And one for my 'keeper' shelf to share with Sicily and Chelsea. "I hope you remember me. 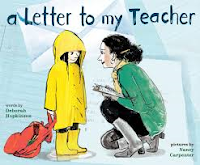 a bright yellow raincoat and a dark, stormy frown - because for me, school meant sitting still ... "
It's second grade. For one small girl, it's her teacher who makes all the difference. As a teacher, I had a special place in my heart for the kids who didn't fit the mold, who acted out, who needed understanding and acceptance. They made me a better teacher every day, and I was grateful to have them in my class so they could teach me what I needed to know. I can only hope that I had the kind of impact this teacher did. The child remembering her year in second grade knows a lot about herself. She can't keep her voice down, she likes to be the class clown, she needs constant supervision on field trips. She marches to the beat of a different drummer. She remembers how her teacher helps her find what she does best, and guides her through her days encouraging her to acquire the skills needed to be a friend and to find success in a place that holds little appeal for her. With each new success, things get better. Nancy Carpenter captures every nuance of the memories the now grown woman shares in this emotional and memorable book. Those emotions are beautifully displayed throughout, in illustrations that capture the exuberance and unleashed energy exhibited. The teacher stands out on every page for the patience she shows and the guidance she gives when the going gets tough. She makes room for a 'different' learner in her classroom. Humor is evident as the two work together to form a lasting bond, one the teacher may not necessarily remember so many years later. The girl does not forget. Her year end gift is testament to the difference a caring teacher can make, and her career choice is proof positive that teachers make differences in children's lives ... every day, and in so many ways. second grade really was the best year ever." What a tribute ... and what a lovely gift for a teacher at the end of the school year. can stop these noble ... "
It's a pretty normal day for Lila's mother. They are on their way to spend some time with Grandpa. For Lila it is just another occasion for allowing her imagination to take flight at every turn. Her mom has a need to keep Lila on task as they get ready to leave, and as they make their way to the meeting place. Lila's mind is full of so much more than following her mom's linear line of thought. What an imagination she has! 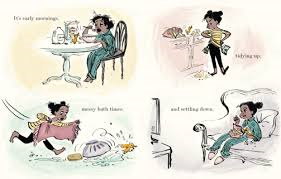 Young readers will be delighted to see that Lila loves pretend just as they do. Moving from page to page, we are carried on wings of whimsy. One double page spread puts us in real time - Mom trying to get Lila to pay attention. The next, filled with Lila's fanciful imaginings. I won't slip, I NEVER fumble! On they go, with her mother following closely as Lila tears through the street lost in her own world. When they finally meet Grandpa, she has a story to tell him. Surprise! It turns out that Grandpa has been waiting patiently for someone to come along whose flights of imagination match his. It's always better to share such experiences with a friend, isn't it? The gorgeous watercolor artwork fills the pages with motion and joy. Kids are going to love listening to it, and will surely want to hear it again. It will surely spark fanciful stories of their own. And, they will LOVE Lila. She has a force to be admired. "I moved forward so I was next to Matthew, standing over our father's knees. I wanted to say something helpful or something brave. Something useful and mature. But nothing came. I stood and stood and stood there, but my lips wouldn't move. Mom stepped up from behind and put one arm around me and the other around Matthew. "It's all right, Claire Bear. Just say anything ... "
Ugh! Grade eight ... it's never easy. Claire knows that the very first day. It only gets worse. What can be worse than zits, mean girls, changing friendships, and boys? You would think that's all a girl can take. In Claire's case, it is undeniably untrue. Our introduction to Claire is a bit of fun. She starts with her father's constant support and witty candor, and the father-daughter dance. Then, she flashbacks to one year earlier. She and her friends are having a sleepover for her birthday, and it looks like rain. Seven of her thirteen birthday parties have been spoiled by rain. Her brilliant, accomplished brother is bothered by the girls and the noise that is interrupting the sleep he needs to be ready for tomorrow's soccer training session. Can things get worse? Yes, they can and they do. The angst just increases when Claire learns that she is being held back in dance class, while her best friends move forward. It's just not fair! When she expresses her anger and sadness about the dance class, her father makes his usual joke. Claire is far from impressed. it still doesn't do any good!" "Well, maybe you need to struggle some more!" Those words will come back to haunt her. It isn't long before a traumatic event changes the course of events for Claire's family. She and her father are at the dining room table when he suffers a stroke. Claire is the only one home, and must take charge. Her father's hospitalization and long recovery are heartbreaking, and life-changing. Her mother and brother step up to do the best they can to keep the family from falling apart. The trauma of being the only one there, and then seeing her father so changed is unbearable. Claire withdraws to her eighth grade self, worrying about those things that may seem inconsequential to many, but are of great importance to this young teen. It is her way of coping. Her brother is finally able to get through to her, and Claire makes the changes necessary to help with her father's recovery. Claire's voice is so authentic it makes the reader feel present in every moment of the book. She is confused, honest, vulnerable, angry and eventually, hopeful. Mr. Sonnenblick's articulate depiction of a family in crisis and the process for recovery following a stroke is compelling and heartfelt. It impacts everyone, including everyone who reads it. If you are not familiar with Jordan Sonnenblick's work, this is a great introduction. It will surely lead you to look for more ... Drums. Girls and Dangerous Pie (2014), Zen and the Art of Faking It (2010) among others, and the upcoming The Secret Sheriff of Sixth Grade (September, 2017). I love watching a pair of robins in my backyard as they make repairs and upgrade their nest from last summer. Well, I suspect they are the same ones. We are told they come back to the same spot year after year. Last year they successfully raised two families of three. Kids will be fascinated to learn about the many different nests birds build, and the very interesting places they find to build them. First, the parent birds want their eggs to be safe; then, they want a protected space for the chicks they hope to raise. The text is simple; the beautifully designed artwork created with woodcut and digital tools is perfect. It is a celebration of the tenacity and ingenuity of the many birds here shown. 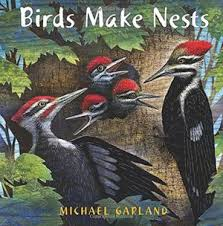 Each illustration includes a serene setting, the common name for the bird in question, and the shape of the nest itself. Often, we even catch a glimpse of the eggs or chicks. Little ones, for whom this book is written, will be drawn to the short descriptions, the beauty of the birds, and a feeling of satisfaction for what they are seeing. The images will certainly encourage questions and further learning. Not all birds presented will be familiar - just another reason for sharing it with someone you love. This is a pleasing and most useful introduction to the nesting habits of many familiar and unfamiliar birds. a lot of big words. What happened to my shorts? Maybe this elastic will work." 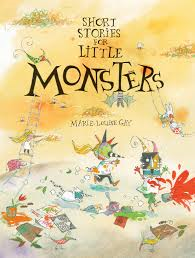 Just when you think you have seen it all, Marie-Louise Gay pens a new book unlike anything she has previously done. 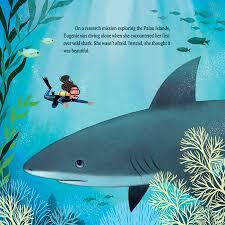 This one is full of the color, the fun, and the terrific detail we have seen in her other books. This time, she tells nineteen 'short' stories, giving kids pause for concern and some careful thought. What Games Do Cats Play? The Secret Life of Rabbits"
To say you will be amused is putting it mildly. You have no idea! Each of the nineteen 'stories' is presented on double page spreads (except What Do Cats See? and What Games Do Cats Play?) and designed in comic book style. Each is sure to engage the audience in discussions, and perhaps even quiet contemplation of those big questions that can cause little ones to stop and ponder. Take the classroom in Who? Me? where the kids do their best to avoid answering their teacher's history question? "OK. Let's see who studied their history lesson last night ... in what year ... ? If I don't move, she won't ask me. If I look like I'm exploring different answers, she won't ask me. If I blow my nose, she won't ask me. If I pretend to pick up my pencil, she won't ask me. If I look calm and relaxed, she won't ask me. If I don't look at her, she won't ask me. If she thinks I know the answer, she won't ask me." The author's mixed media illustrations use text box dialogue that is sure to attract attention and hold interest. There is a lot of mischief making, and the subject matter is sure to please. Both smart and funny, your kids are going to LOVE it! "Mama Penguin had a big journey ahead of her. She and the other penguins will travel far to get food for their families. ... and climb down cliffs. Let me just tell you this: life in not a 'bowl of cherries' for a southern rockhopper penguin chick. When they are first born, they are cold. It's the Antarctic, after all. Lucky they are to have parents who understand that, and can protect them. Next, they are hungry - all the time. Again, they are blessed with parents (this time, a mother) willing to head out to sea in spite of the cold and the dangers inherent in facing orcas, sharks and sea lions. Finally, it's boring waiting for a parent to return when you are hungry. So, finding a friend to commiserate with is a necessity. Finding none, our little guy (or gal) heads off to explore and learns a well-learned lesson, we can only hope! Papa does do parenting duty while Mama is off filling her belly with fish and krill. It's advantageous that Papa has an eye for trouble, and recognizes the danger inherent in a skua's need for food. He keeps his chick safe, and the two return to the colony following the chick's exploratory shenanigans. Guess who's waiting for them? Then, it's supper and bedtime for one tired and satisfied baby - and the same for its parents. 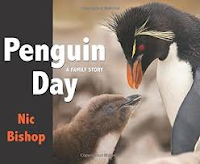 "The author spent three weeks photographing rockhopper penguins for this book. Severe gales and freezing temperatures often made things difficult for him but never daunted the penguins. Every day they ventured into stormy seas and climbed home over tall cliffs, meeting each challenge with feisty determination." An author's note provides helpful information about the penguins themselves. Might I just add that they are quite stunning with their bright beaks, red eyes and distinct crown! and wear a suit and tie. and spend hours on the phone. he's a dad that stays at home." This book is going to get a whole lot of love and much well-deserved attention. You can count on that! I am hoping that if it the first book you have read by the amazing Hope Anita Smith, it won't be your last! You need to read her powerful poetry and see her gorgeous torn-paper collage artwork. I am adding a few spreads from this new book at the bottom of the post. You can see for yourself just how special they really are. 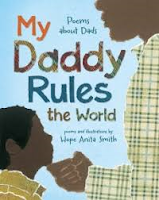 "This book is dedicated to dads, daddies, pops, and poppas. gap offering guidance, love, and support to children in need. It is, indeed, a celebration and a perfect book to share with kids and their dads today, and every day! The bonds are clear and strong. The times shared are shown here with humor, heart and candor. 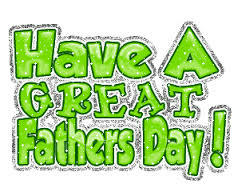 There are so many things that children do with those who 'father' them. In a series of sixteen poems Ms. Smith describes making breakfast, being strong, sharing books, teaching a child to ride a bike, even snoring. that's as loud as a riot! 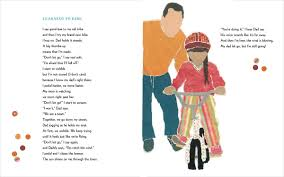 What joy to share these poems with little ones and their families, allowing them to think about and describe the many things they do that make time so special when spent with Dad, or Papa, or Uncle Jack. The illustrations are faceless, yet still strongly show the love and comfort felt between the two. The child narrators aptly note their feelings for a very special man in their lives. They are small moments that are forever remembered and that mean a great deal to each and every one of them. 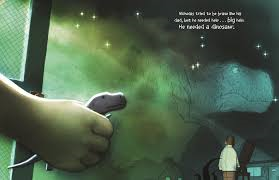 There is nothing Nicholas worries about when his trusty dinosaur takes up residence in his pocket, even though he does harbor a few fears without it: of the dark, of bugs, and of whatever is on the underside of a manhole cover. He doesn't want to be afraid; he would rather be just like his dad, Big Nick. He isn't afraid of anything! As long as the dinosaur is where it is supposed to be Nicholas is content. He climbs walls, scores against impressive soccer goalies, swims like a fish. So, after sticking it in his sock during the soccer game when he scores a goal, he assumes the dinosaur is secure. Or is it? leave, the dinosaur was gone. Danger lurks outside the car on the drive home. No dinner, no dinosaur to help him settle to sleep, bad dreams. 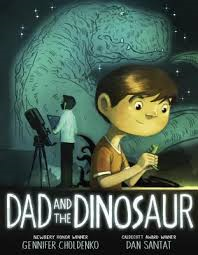 With Dad's encouragement following a bad dream, Nicholas finally admits to losing his dinosaur. Off they go to search again. Find it they do, and bravery returns! Now, the two have a shared secret. Dan Santat does a superb job using mixed media to create a soothing look at fears allayed. The dinosaur is evident as a calming presence on many spreads, as are the fears when the toy is missing. 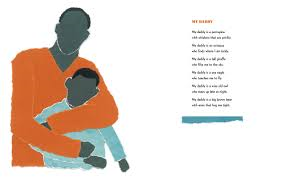 Great storytelling and expressive, knowing artwork make this a book perfect for sharing, and especially comforting when celebrating Father's Day tomorrow. What a collaboration! "Plant a farm in a truck! In a box or a bike! Huzzah! Today is the day! It's the first market of the season for our independent gardeners, Stephanie and Teri. I placed my order earlier this week. Now, I get to pick up all of the deliciousness. I have only a small inkling of how much work has gone into growing, harvesting and cleaning their produce to be ready for purchase today. How grateful we are for their dedication and knowledge! 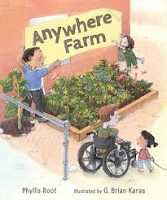 More and more families are appreciating the benefits of the farm to table movement, and some are growing ever more interested in setting up their own little gardens - 'anywhere farms'. In this poetic homage to growing your own, it is evident that it doesn't take much to get started - soil, and sunshine, some water, a seed. That's it? Well, you will need some space. The city kids who people this book's pages find that even a small space will do just fine! makes a good growing plot. or a window will do." Indeed they will. Kids will be intrigued to see the many ways they can plant and grow for their own consumption. What can be grown is almost unlimited. The benefits to birds and insects is immeasurable. The best part - sharing your produce and your knowledge. What is more satisfying than making the world a better place? With careful preparation, leadership and persistence, a community garden might just sprout up where you least expect it! Joyful and empowering, entertaining and educational, this is a celebration of what can be done when we put our minds and hearts into improving our community. 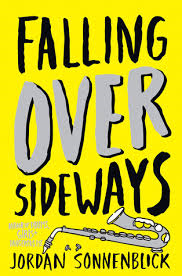 Brian Karas creates a setting full of life and hope, where anything might happen. "A fifteen gallon tank was much too small for sharks, but Eugenie saved her allowance to buy guppies, clown fish, and coral-red snails. It felt as big as an ocean in her room. Their small apartment became an aquarium, a laboratory, and a sanctuary." I can't imagine it, although I will admit I am fascinated by the passion that Eugenie Clark felt for sharks at a very young age. She saw them while visiting an aquarium in New York; her life changed that day. From then on she did her best to prove that sharks were not the killers so many people thought them to be. Her path was set. She spent much of her life, despite the many obstacles put in her path, wanting to prove that they were special. As she studied them, she was able to debunk many of the assumptions made about them. People began to refer to her as 'Shark Lady'. Deservedly so! Her determination, courage and unrelenting research and observations are the basis for this articulate look at her life and work. It was not an easy time for women looking to have a career considered unusual and dangerous. She didn't stop at learning about sharks. She also discovered several new types of fish during her time she spent in the ocean. "Sharks were not mindless killers. Sharks were beautiful. Sharks were smart. was now a dream come true." 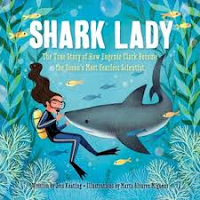 Further to the text of this lively picture book biography, Ms. Keating adds a section on additional 'shark bites' - informative paragraphs that add interest. A time line begins with her birth in May 1922 and follows her throughout her very eventful life, until her death in February 2015. An author's note explains why Eugenie's story is important, and a bibliography offers additional resources for those interested. I love that this series of graphic novels moves from one to the other as a continuing story for fans, and seamlessly. 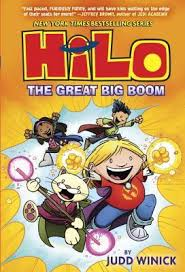 At the end of HiLo: Saving the Whole World, Gina had been drawn through a portal. D. J. and HiLo are on a quest to get her back. It's not as easy as one might think. HiLo is in a fight to regain his memory while D. J. is struggling with facing his fears. He wants to help find Gina and bring her home, but can he? Getting through the portal does lead them to Gina. Now, the real work begins. Even staying together is a challenge. Getting back home seems almost impossible, but they haven't let that stop them in their other adventures. HiLo is on the cusp of remembering what happened in his past, how he got to Earth in the first place ... and why? Their arrival on Oshun brings the friends in contact with warring nations. Flashbacks begin to piece together HiLo's past. He meets someone there who might help him remember it all. He is worried, but he moves forward with learning more. He is encouraged to do so by his friends. Fans of the first graphic novels in this series are going to love this new one! The structure in the panels, the high drama elicited by bold fonts, and the familiar characters will draw them in to the mystery, magic, fast paced action, humor, new setting, superpowers and strong friendship! Who could ask for more than that? If the story is confusing to readers not familiar with HiLo, D. J. and Gina, hand them the first two ... they will soon be on their way to becoming fans themselves. And, they will be reading. Hey! Judd Winick has plans for three more! All we have to do is sit and wait for the next. It can't come soon enough, can it? "Some people left the village - singing loudly. Others stayed behind and learned to hum. The rest were just grateful to have a good night's sleep, for crying out loud. Seven very quiet years passed. Then one evening, a saucy gallito and his family wandered into the village and roosted in a fragrant mango tree. When the little rooster awoke ... "
La Paz is a village filled with people, bold color, song, and noise ... too much noise! The old mayor is fired, and Don Pepe is elected the new mayor. He takes action immediately, banning 'loud singing in public'. Ah, the villagers are happy. Don Pepe likes the power afforded him in this new role; soon there are other restrictions. For seven years the village is silent. Teakettles won't whistle, people move away wanting their voices to be heard once more, the remaining villagers enjoy the peaceful, hushed ambience. The arrival of a rooster and his large family elicits a change. 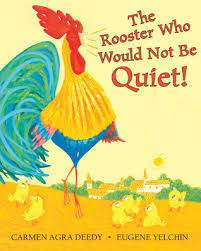 That little rooster has a big voice, and is not afraid to use it. The morning following his arrival, and right under the mayor's window, he bursts into song. The mayor will have none of it! The mayor threatens, the rooster sings. The mayor chops down the tree that brings the rooster great joy, the rooster sings a sadder song. The rooster sings for his family, the mayor puts him in a cage where the rooster sings a lonely song. The rooster sings a song of thankfulness for the corn he is fed, the mayor removes the corn. The rooster sings 'a hungrier song. A blanket over its cage to block out sunshine does not keep the rooster from singing his songs. them as well, senor, how can I keep from singing?" It is a resounding message for those gathered. Their reaction has lasting results. Eugene Yelchin's oil pastel, colored pencil, gouache and acrylic images are perfect for this folkloric tale. Mood and emotion fill the book's pages, changing from bold to blue and back again as the story ebbs and flows. His rooster is ever cheerful and defiant, Don Pepe is arrogant and autocratic. I love the strong colors and lines, and the boost of spirit he brings to an already spirited text. Carmen Agra Deedy leaves readers with a clear message in her author's note. strong and true - and irrepressible. But not all of us." Lolo's buckets begin to fill. 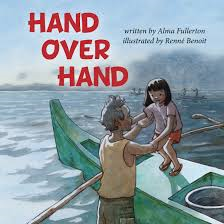 In the Philippine fishing village where Nina and her grandfather Lolo live, a girl has no place in a fishing boat on the sea. Nina is not ready to accept that. Somehow she convinces her grandfather that she can handle being there. Lolo has some conditions: Nina must bait her own hook, and bring in any fish she catches. She makes the promise, and off they go - much to the chagrin of other fishermen from their village. As the day passes and Lolo catches many fish, Nina has no such luck. Her grandfather is patient and encouraging. She is discouraged. Just as she is ready to accept defeat her line is tugged by a large fish. True to her word, and with her grandfather's guidance and advice, she works hard to bring the fish aboard. Arriving back at the village, the other fishermen are surprised, to say the least. They are told she landed it just as her grandfather taught her - hand over hand. Impressive! Alma Fullerton's storytelling presents a cultural story that is timeless. Her sharp description and repetitive phrasing, lively dialogue, and rhythmic words make the reader feel as if they are out on the sea with the two for a day's fishing. It is a gentle and empowering telling. Renne Benoit takes us to sea in her stunning, and detailed, watercolor images. We ride along with granddaughter and grandfather as they pole across the bay, sit quietly awaiting bites on their lines, and then we are made aware of the long fight it takes for Nina to land her catch. The sun is setting when the fight is done, and the two are ready to pole back over sun-dappled waters to their village. It is just lovely! "Sophie was nervous around my father at first, so he was careful not to look into her eyes or pet her or get too close. Instead, he spoke to her gently and made her the yummiest dinners. Friendly voices relax dogs and help to build trust. Soon she came to love him the best of all." Are you thinking about getting a new dog? 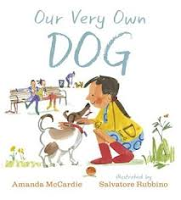 Or, do you already have one, and just want to know more about life with a canine companion, its needs and care. In both cases, I think you will find this book deserving of your attention. A young girl and her family are the proud new owners of a rescue dog. Sophie is a tad cautious at first. Quickly, she recognizes that her 'new girl' is worthy of closer inspection. The family are certainly eager. "A chew toy is useful because dogs need to chew. It's natural, calming, and good for their teeth." I call these books faction as the author includes pertinent data to accompany the story being told. Sophie fits in quickly with her new family. There are adventures and mishaps, all normal fare when dealing with a pet. But, Sophie responds well to her training, the many new discoveries, and the walks in the park where she meets other dogs. She enjoys their company! In end matter, the author encourages families to do their homework before getting a new pet. Then, learn by watching and responding to their pet and the cues they give, including a dog's body talk. An index will take readers back to pertinent information, and the author suggests two titles that could add to a knowledge base about dogs. Salvatore Rubbino's loose mixed media images are most appealing. They are both calm and chaotic (a perfect look at life with a dog). 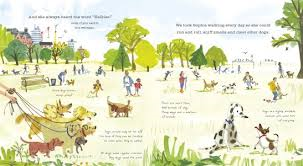 You may find an image of your favorite breed on the book's endpapers, and you will surely find many engaging illustrations as you read it again and again. "Sometimes people tried to get Jameson to wear pants of a different color. But one way or another, Jameson made sure they didn't end up in his closet. One day Jameson's cousin Armando came by with his fiancée, Jo. Jo had the nicest smile Jameson had ever seen, and her eyes seemed to sparkle like the autumn sun shining upon a running river." I think you know how Jameson will respond when asked to be in Armando and Jo's wedding party. It's not hard for him to reply with a resounding yes to Jo's request while looking into her bright eyes. 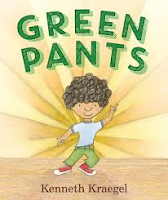 Remember though - he loves his green pants. In them, he can do anything, and he never wants to take them off. The day after agreeing, Jameson's mother asks him to be sure it is what he wants to do. She explains it is an important day that will mean a lot of standing around, and that will require plentiful smiles and good manners. Jameson has no problem with any of that. There is one more thing, however. "And one more thing," his mother said slowly. "Okay." Jameson nodded. "No problem!" "Jameson, the tuxedo will be black." "WHAT?' Jameson gasped. "BLACK pants? Oh, boy! Looks like there might be a problem. The preparations move forward ... finally, it's the wedding day. How will he decide what he should do? It's a very difficult decision, left to Jameson. Will Jo's spirited welcome make it any easier? You betcha! This is an appealing readaloud sure to be enjoyed by children, their parents and their teachers. We all know, or have known, someone like Jameson. Hopefully, we also honor a penchant for green pants and personal choice. 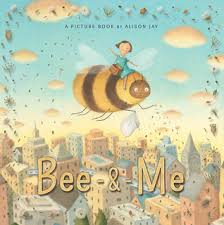 Wordless picture books are the 'bees' knees', aren't they? They tell an often complicated and sometimes disarmingly simple story with polish and power. They are perfect fare for little ones who are just learning how stories work, for older literate children who have the savvy to connect their lives to some of the events of the illustrated tale, and for children who are learning a new language in a new community. 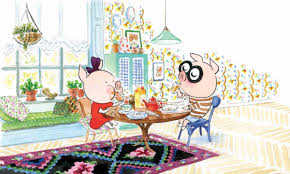 Wordless books show that stories are the same in any language; we each bring our many experiences to the 'reading'. Our first glimpse shows a stark urban landscape, filled with people, buildings, means of transport. A turn of the page shows an apartment building, its inhabitants and the bedroom of a small girl who will soon run in terror from the large bee that has flown through her bedroom window. It is an ominous opening. Armed with a swatter and a determination to rid her room of the interloper, she reacts to the its plea for life. Popping it under a glass, she looks to her book for advice and learns how to revive the bee from the stupor that resulted from a lack of air. A sweet drink does the trick. Once revived, it flies off. A rainy night and day occasions a return for the bee, looking worse for wear and in need of food and warmth. The two become fast friends, enjoying each other's company as the bee has a growth spurt. He also longs for fields of flowers. Large enough now to carry his friend, they fly to the countryside. Once there, they gather seeds and sprinkle them along their flight path, say a sad goodbye and wait through winter and spring before seeing each other once more. The fruits of their inaugural flight are evident everywhere we look, changing the bleak urban landscape to one filled with spring abundance and brilliant color. 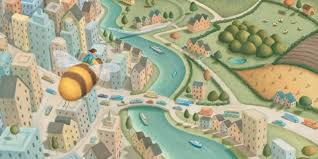 As this appealing tale ends, Bee Aware provides useful information about bees and how we can help them survive. So much to see, and absolutely worthy of your attention. "After what seems like forever, Paul finally stands up. Antoinette doesn't waste a second. "Come on, Paul! Now's our chance or we'll never leave this gloomy house!" Antoinette knows that Paul doesn't like going outside very much at all. But once he does, Paul can't help looking around for something interesting to do. When Paul sees beautiful gold button flowers ... "
If you have kids you will know how different they can be! We share family stories to prove the sentiment at every turn. Do you? Paul and Antoinette fit that mold. Paul loves all things neat and tidy. Antoinette does not have the same sentiment for the way things are done. knives is her favorite thing! Quite the difference! It doesn't end there. As we follow the siblings through their day, we become more and more aware of those things that matter to the bespectacled, clean-faced brother that have no meaning for his smudgy, full-of-adventure sister. Antoinette is willing to wait patiently as Paul follows up his early morning routine with a 'short something'. As soon as he looks as if he's moving on to another indoor activity, his sister hustles him outside. Thank goodness! He's not keen; but, he can't help noticing the nearby flowers and thinking about the Ikebana instructions he's been reading every night. Meanwhile, his sister is licking an unimpressed snail. So, their day goes. Wandering in their wake, listeners are sure to be giggling about the kind of tomfoolery that pleases her, and the staid bits of trivia Paul provides. Will her exuberance be contagious? You will have to see for yourself. So much personality is shared on each page of this beautifully designed book. Using endearing and expressive watercolors and providing gorgeous backdrops (especially for the outdoors scenes), the artists expand our understanding for the nature of each sibling. We grow to love them both! "Take a good look at that long giraffe neck. How many bones do you think support it? Surprisingly, despite its length, a giraffe neck has only seven bones - the same as a human one. By contrast, long-necked birds, such as swans, have as many as twenty-five neck bones. The skulls of adult males, which weigh about 10 kilograms (22 pounds), ... "
Just as Rob Laidlaw did in 5 Elephants (Fitzhenry and Whtieside, 2014), Anne Innis Dagg brings her plentiful research, her vast knowledge and her love for these gentle giants to the pages of this new book, a fascinating look at five famous giraffes. They live in captivity and in the wild, and many face an uncertain future. By getting to know Lmara, Safari, Gemina, Foo8, and Msitu better, it can only be hoped that readers will find a place in their hearts for these beautiful creatures. It may even lead them to become a Giraffe Guardian, and work closely to protect them. Their stories are varied, and well told. Ms. Dagg loved them from early childhood and spent much of her life studying them, beginning in 1956. Fresh out of school, she decided to travel to Africa where she would study them in their natural surroundings. "Now she is a well-known animal rights advocate, scientist, teacher, and the author of many scientific papers, articles and books. She is also the first person to have studied a large mammal - the giraffe - in the wilds of Africa." As giraffe numbers rapidly decline, it is only through education and a determined effort that they can be saved from extinction. Hopefully this book will encourage each one of us to get involved and make a difference. There is so much wonderful information provided in its fifteen chapters. 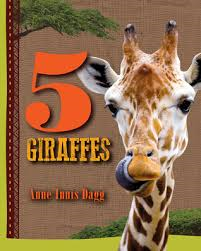 We learn a great deal about each of the featured giraffes. We also learn what giraffes like to eat, how they evolved, and about their anatomy, the way they walk, their social life. It is a truly fascinating look at the challenges they face and the help they are getting from interested scientists and concerned citizens. They have much to teach us. Full of many engaging entries, this is one of the only books for older students I have seen, and it is certainly worth a close look. The profiles of each of the 5 presented for our attention brings a sense of urgency and connection. The photographs are much appreciated, and the illustrations useful and informative. 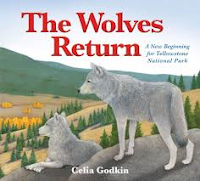 The author ends with making a case for studying these beautiful creatures in their own habitat, but also sees the place that zoos once played in creating interest in them. She encourages her readers to be vigilant, and supportive on their behalf. End matter includes a glossary, an index, and a bibliography. tiny wings and downy head. shoe box right beside the bed. tucked in tightly, head to toes. 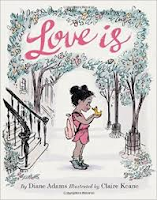 Love is waking up together ... "
When a wee duckling forgets to pay attention to her mama and siblings, and takes note of a butterfly instead, she finds herself lost and subsequently adopted by a wee girl with a heart of gold - and a burgeoning love. That love is tested numerous times. It is especially noticeable in the middle of the night when a loud quack means 'snack!'. Fed up, tucked in, and wrapped in the warmth of little arms bring peace and contentment. The morning arrives far too early, and is fraught with little bumbles as the two try to share their day. Sunflower seeds and television bring an end to that first day together. The duckling quickly grows in days filled with new learning, and great anticipation for every new accomplishment. Countless happy moments and a new sense of self points to a time for new adventure. to lift those wings, to travel on." Her departure brings sadness, much time for remembering, and a fervent wish that things need not change. It is, however, inevitable that they do. Change can then bring other joys! Sicily is going to love talking about the attractive and endearing illustrations when we share this in June. I love the lines, the tiny details, the spot images, and the emotions shown. She (at almost 3) will have much to say about the 'oops!' moments and the love shared between the two. As I did a while ago, I thought I would add a second book to today's post. 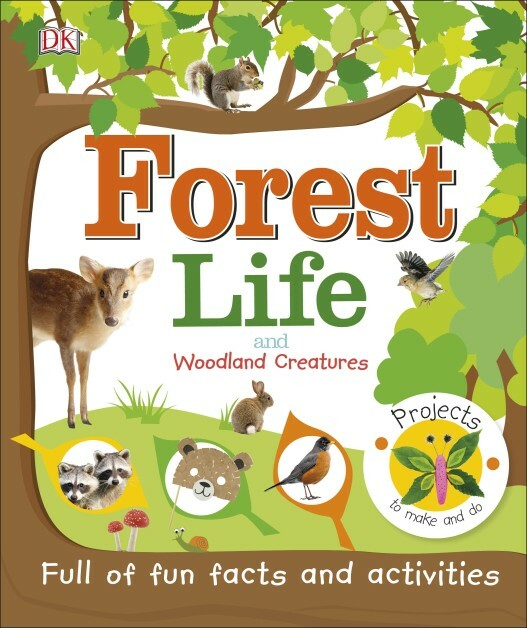 It also explores forest life by introducing young readers to the habitat through a number of activities meant to up their understanding. 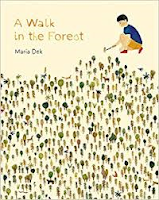 Filled with factual information, clear illustrations and photographs, and designed to be accessible and useful, it is a great complement to Maria Dek's A Walk in the Forest. The activities are meant to encourage kids to try their hand at a variety of projects. For each, a list of needs is followed by a numbered process that leads to the completion of the piece of planned work. Make leafy bugs, plate nests, berry ice pops, a pinecone owl, and a bear mask. Facts presented give kids a chance to learn about the forest itself, the creatures that live there, the growth from seed to adult tree, the refuge a tree provides, the food the forest furnishes for its many inhabitants, the bugs and insects that make their homes on the forest floor, and other forest creatures whose presence is felt during the day or at night. Another DK book that is sure to inform, encourage and help kids get involved in the world that is theirs to explore. 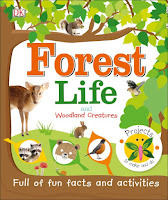 Search www.dkfindout.com for 'forest' and you will get 20 results sure to lead to enhanced learning. "Run wild in the jungle! See where they lead you. 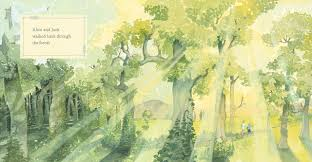 As the young boy approaches the forest from the left of the opening spread that is mostly white space, does he have an inkling for what he will find should he explore it? I wonder. It doesn't take long until he is eagerly peering around a tree trunk at the vast array of growth before him. There is much to discover in this new 'forest' playground, and he makes the best of it. Encouraged to 'run wild', he is surrounded by the beauty of the trees, the vines, the flowers and the many creatures who make their homes there. Shouting may occasion birds to take flight, but he need not worry about the noise he makes. Everywhere he looks there are footprints to follow. Go ahead, explore! is the invitation at every turn. The beautifully rich illustrations were created with watercolors the artist applied using a brush. The work is careful, and encourages quiet contemplation of all the forest has to offer. She surprises her audience with variety in perspective, encouraging them to step back at times, to look from above and even to zoom in to capture careful detail at others. It is a book filled with 'treasures', a sense of joy and wonder, engaging its readers at every turn while continually fostering a child's need for outdoor exploration. "At the zoo, Poppy's favorite animals are the alligators. She presses her face up against the glass and smiles at them. She loves it when the alligators smile back. She'd stay there all day, but her family usually drags her away to see some boring birds. Poppy thinks vampires are cute ... "
You know those kids - nothing scares them, or so they profess. 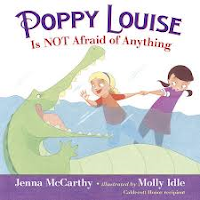 Poppy is one of those kids; a girl who knows that she can face anything and never be afraid! Poppy Louise wishes her friends felt the same way. Undaunted when handling snakes, feasting with imaginary monsters and dreaming of racing cars for a living, she shows disappointment when her friends would rather have the lights on, do a puzzle, go on the kiddie rides at the park, or read books. What a catastrophe! Her family is concerned when she suggests outlandish ideas for family walks in the dark of night. Her sister Petunia is cautious, and doesn't mind being that way. Poppy has her way of doing things, much to the irritation and concern of her family. There is so much she loves they just cannot appreciate! Petunia tries to scare her sister. Nothing works. Then, when Petunia is scared, Poppy is the first person she calls. Poppy loves to help. When Finn's rocket gets stuck in a tree, it's Poppy to the rescue. Her descent is cause for concern on Poppy's part - something she didn't consider as she made her way to the uppermost branches to retrieve the rocket. Petunia does some coaxing, Finn helps with the ladder. Poppy is very careful as she makes her way back to earth. Maybe there is ONE little thing that Poppy is afraid of - what do you think? Molly Idle creates expressive, energetic illustrations to show Poppy at her most plucky. They are as playful as the story itself and will keep young readers attentive to Poppy's emotions throughout the telling. "That award goes to the zorilla, a weasel-like carnivore that, although similar-looking, is only distantly related to skunks. And although skunks might be able to pack a punch with their powerful fumes, it's a relatively local stink. The stench delivered by the zorilla is even more potent and can be smelled nearly a mile away." Who knew? Obviously, Martin Brown took it upon himself to do a brilliant job of research and gathered together this truly amazing group of animals for our education and entertainment. "It's time for a book that's different - without the same ho-hum, run-of-the-mill creatures we're served day in, day out. 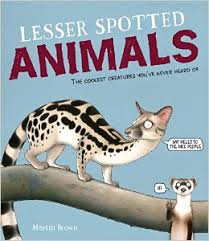 No pandas, elephants, or zebras here - this is a book about the world's other animals." Indeed, it is! 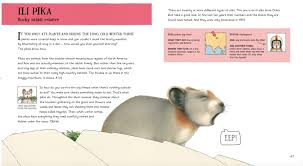 There are 21 'lesser spotted' animals described in this beautifully designed and illustrated book Each entry contains a descriptive heading, a humorous accounting for the creature exposed, and an information box that includes size, what they eat, where they live, status, and an extra tidbit of intriguing and unique information. Each new entry is full of fun, facts, and a truly enjoyable narrative voice. I found myself smiling at each turn of the page, while also filling my head with brand new learning. It could not have been easy to gather the data. Mr. Brown makes mention of that in his entry about the silvery gibbon whose population has dropped to 2000, due to shrinking habitat and people wanting them as pets. "There are fifteen or more different types of gibbons and some of those different types are divided into even more varieties. That's what makes finding out about some animals so difficult. Even though somewhere there might be something that's familiar or famous, a similar type of beastie from over the hill could be utterly unheard of." When we have the opportunity to share such a wonderfully crafted book, we tend to forget the hard work done to bring it to us. 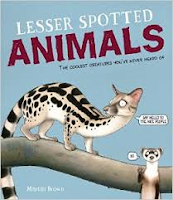 Adding to the humor that infuses its pages, the artwork includes thumbnails that compare one animal to another. The expressive faces (especially the eyes) range from disdain, bashful, wary, to anger, fright, hurt, boredom. They are, perhaps, not pleased with the attention given them after lives of relative obscurity. Kids are going to love hearing their stories, though ... I am sure you will read it more than once. The added benefit is that it provides opportunities for discussion concerning animals and the environment, and how we can continue to protect it. There must be more creatures on the list of 'lesser spotted', Mr. Brown. Can you tell us about them, too? Big Bear is back, and his fans are sure to be delighted with his return. Of course they will also be expecting a great deal of chaos, knowing how hard of hearing he is and the trouble that it brings to following any directions given by Old Oak. This time, the issue is sharing! It takes patience, which the oak tree has, and a few tries. Finally, Bear gets the message, but not before a few funny, funny scenes that will have little listeners giggling with delight. Bear looks much the same as he did in two previous books, Sleep, Big Bear, Sleep! and Sneeze, Big Bear, Sneeze! His tummy may seem a little fuller - and well it should! 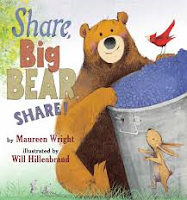 "Big Bear smiled and rubbed his tummy. The berries he'd picked were very yummy! He lounged by a tree and laughed with glee. "These berries," he said, "are just for me!" How rude! If you check Will Hillenbrand's image of the oak tree in the background, you will know exactly how he is feeling about the abundance of berries headed straight into bear's belly. He is not impressed, and he has something to say about it. "Branches shook on the old oak tree,. He didn't pay attention like a good bear should." Just as we expected, it takes some time for the tree to make its point. After combing his 'hair' going to his 'lair', checking under a 'chair', and even jumping up to 'scare', Big Bear FINALLY gets it ... Lesson learned in a story full of wit, charm and illustrated to match. Perfect for reading aloud, this book will be enjoyed by all who hear it. You will not be able to read it just once. I guarantee that!